The coolest thing about having CAR137.com is finding beautiful motoring examples of makes I have never heard of. 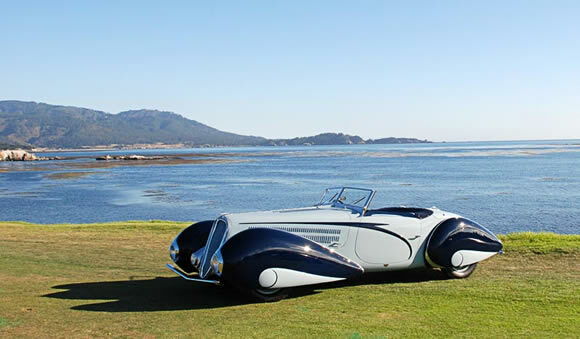 Delahaye 135M was the name of a chassis built by the Dalahaye Automobile Manufacturing Company and clothed by various famous coachbuilders of the time. This one is by French coachbuilders Figoni et Falaschi who built at least nine cars using the 135M chassis. Each one as beautiful as this. Figoni et Falaschi were considered the best French coachbuilders at the time and Delahaye had a reputation for 'powerful, reliable automobiles'. A match made in heaven then. What I love about cars of this time is that the cars were always raced and then used as daily drivers. Not something easily done these days and a testament to how strong and powerful they were. By 1937 the Delahaye cars were winning lots of races and had a 3.2 litre, six-cylinder, overhead-valve motor (from a Delahaye truck) producing 110bhp with triple Solex carburetors. Cool.